“I am brave. I am strong. I am pretty. I have achieved a lot of my goals,” is how Jeannie describes herself. But the foster child is hoping to one day realize her dream of being adopted. The 11-year-old has a caring and compassionate nature. For example, if she had one wish it would be to contribute $500-million to the poor and to have 500,000 mansions for people and pet. Some of her favorite activities include playing freeze tag and Skip-Bo, jumping on a trampoline, riding four-wheelers, going swimming, and playing with her American Girl dolls. She’s a fan of chocolate, pizza, and hot wings. She also enjoys being social. She likes animals, tinkering with electronics, and dancing. “I think I want to be a professional dance teacher. You can just be you when you’re like doing a dance – just get your emotion out,” said Jeannie. Sharing her emotions with a parent or parents would be huge for her. “She desires to be loved and supported unconditionally,” explained her worker. If you’d like to learn more about Jeannie, click here. 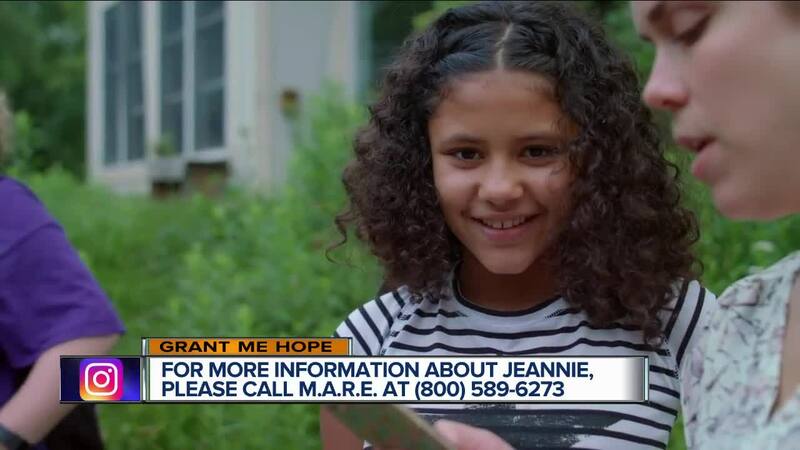 If you’d like to find out more about fostering or adopting Jeannie, please call the Michigan Adoption Resource Exchange at (800)589-6273. You can always help by sharing this Grant Me Hope story on social media. Thank you!